Now that my make up effects gig is over I am jobless, but that does not mean I have nothing to do! Between yesterday and today I have done 6 loads of laundry and still have one left to do! The curtains in our bedroom are up, the boxes are dwindling and the dvd shelves are up. I feel like the apartment as a whole is finally coming to completion. Now all that is left are the shelves for the bedroom that we still have to purchase and a rug for the living room. I seriously promise, pictures are coming! Sooo…I had the Nike Human Race on Saturday morning. 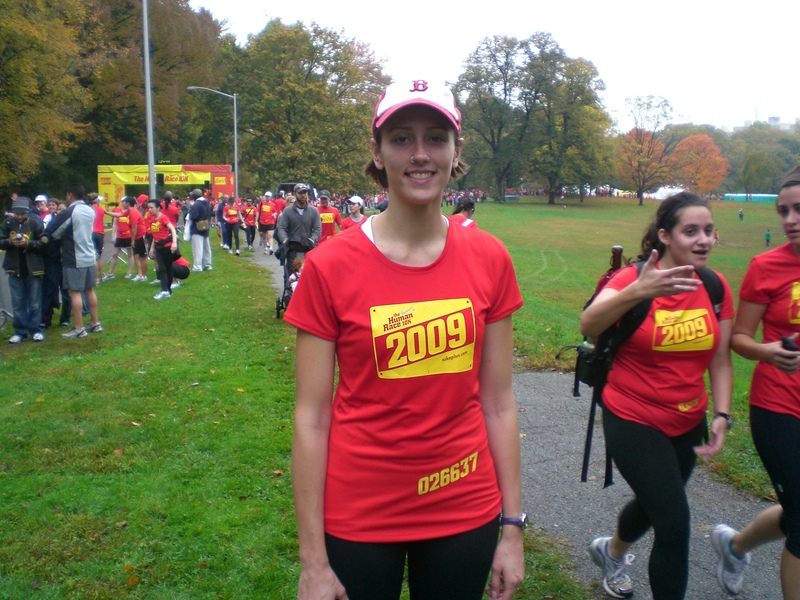 I was a little nervous about it because I have been really slacking in the running department. Had to get up real early on Saturday morning and so did my amazing boyfriend. I am happy he came with me even though he had minimal sleep all week! There were so many runners, it was awesome! I love big races. I barely got there on time, I literally go to my place in the start line and had like 3 minutes. The race went well, but honestly it was a little boring. We just went around in a a circle 2 1/2 times and I was kind of expecting it to be a lot better. Of course, like at every race I always look back and think I could’ve pushed myself harder. This was my second 10K ever and I came in at 57:30. It’s also my first race where I did not do better than the last. It’s a little disappointing, but I am still happy with my time am glad that I could run the whole way. I am also annoyed that the race results that are posted online only reveal the clock time and not the chip time. It was a good thing I brought my watch because I didn’t cross the finish line until a good 2 minutes after the gun went off. Oh and ultimately I wore way too many clothes because I was HOT! I should not have worn pants or two shirts. For lunch I made a repeat meal. Yesterday I threw together a few things and made it into a burrito for dinner, but today I had the leftovers and made another one for lunch. 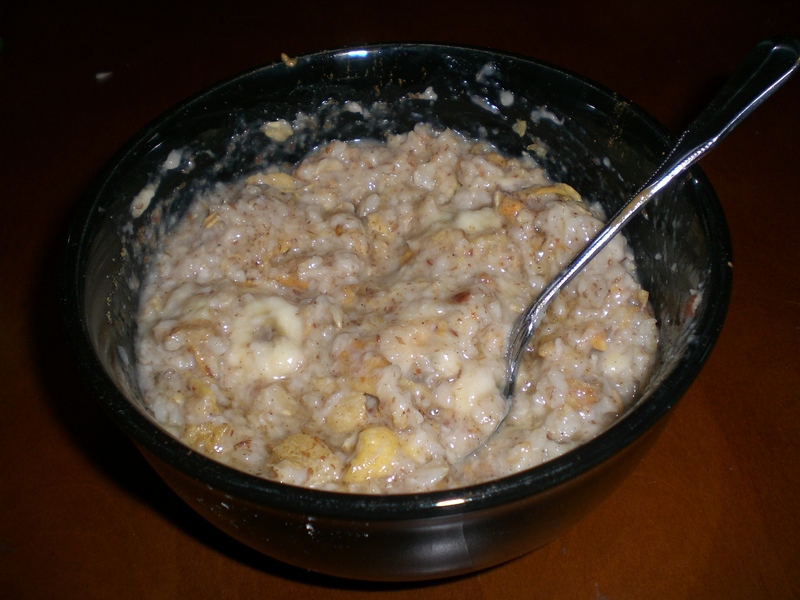 This was so good and I am going to make this often. 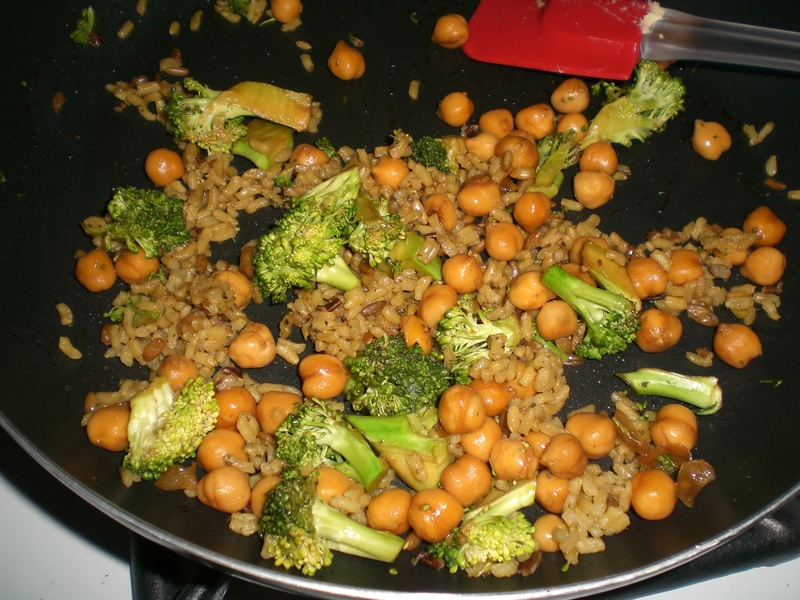 All I did was saute up some broccoli, chickpeas and a little bit of cooked rice with some soy sauce until it was heated through. 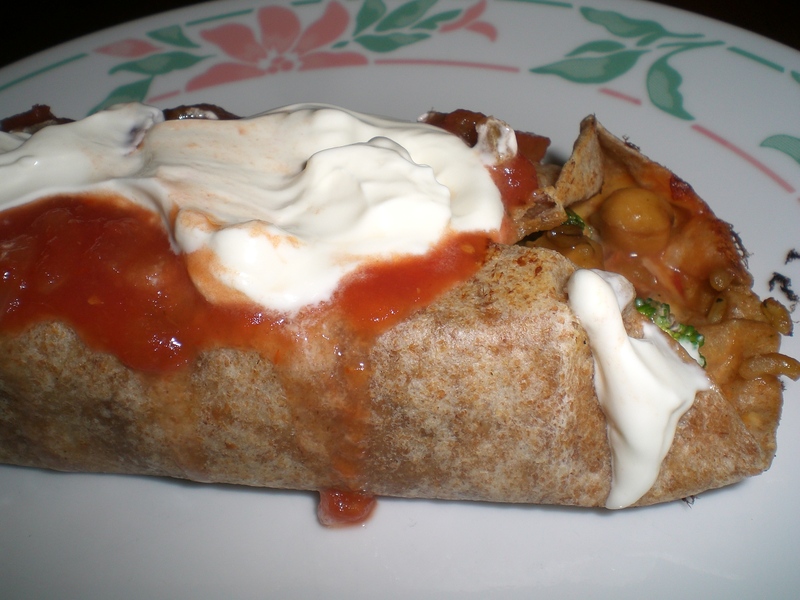 I then put some salsa and hummus in the wrap and folded it all together. Then I put it back in the pan to give it a nice crisp on both sides and topped it with sour cream and more salsa. I have been having unhealthy cravings for burgers lately and I have no idea why. I decided to make some bison burgers tonight so in between all of my laundry havoc I managed to make it to the grocery store to pick up the necessary ingredients. 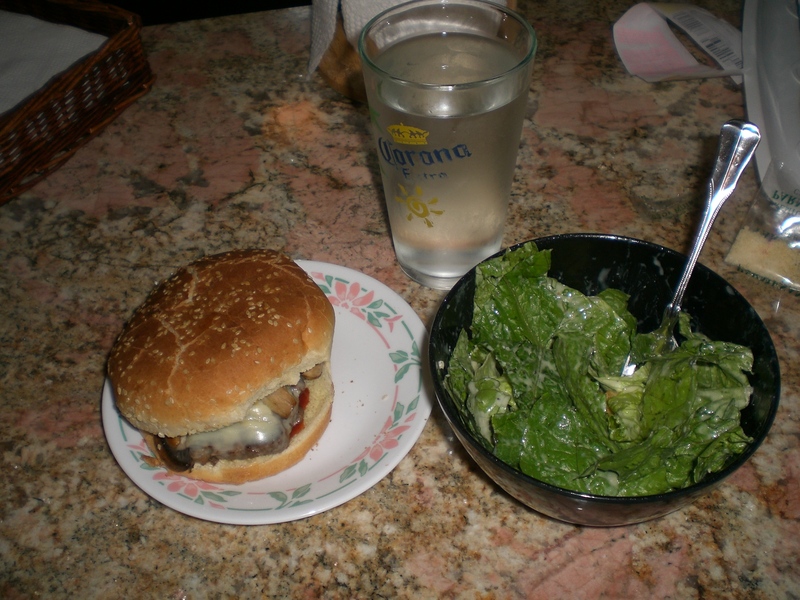 Mushroom Cheese Bison Burger and a caesar side salad. 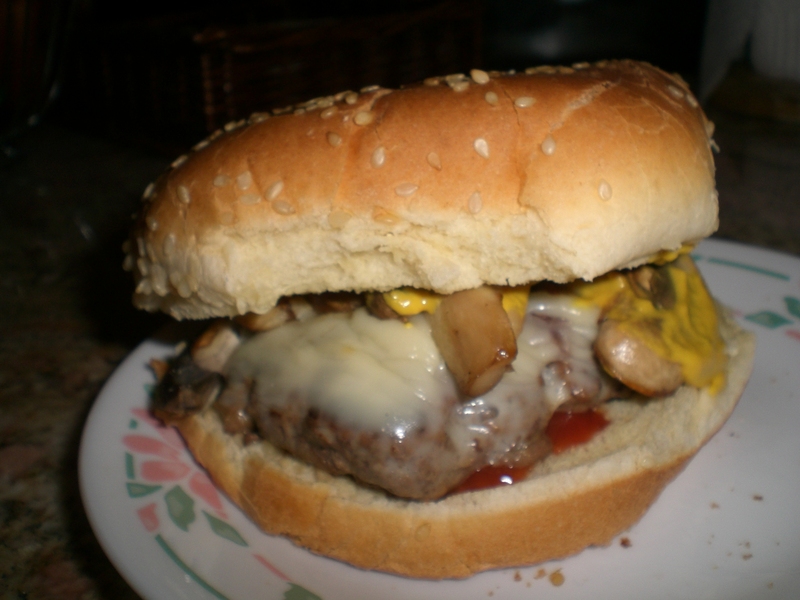 Does that not look like the best burger in the world?